When life itself seems lunatic, who knows where madness lies? Perhaps to be too practical is madness. To surrender dreams – this may be madness. Too much sanity may be madness – and maddest of all: to see life as it is, and not as it should be! Luckily, I was born with an innate sense of optimism. Within the sea of impulses, thoughts and emotions in my head, there has always been this particularly buoyant one. Over the course of my life I have cultivated a relationship with this “logos” or inner guiding voice and it has helped me to develop a more positive perspective on my life and life overall. Before I read anything at all about Plato, the ideal of a life worth living being one that is focused upon the just, the good, and the beautiful made sense to me. The just, the true, and the good can be a bit hard to pin down but to me or any beholder, the beautiful is self-evident and my pursuit of the beautiful has brought with it some insight into the other perhaps more noble concepts and they have brought me to this point. To me, Fakahatchee’s native orchids are beautiful – to protect and conserve them is good and to bring back those that were wiped out by short-sighted human enterprise is just. I returned to Cuba for the fourth time in two years, during the last week of November, 2014. 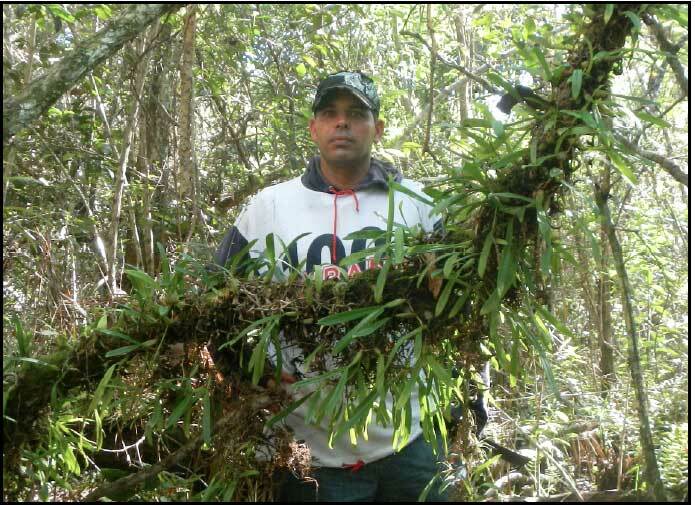 Six months beforehand, my colleague and friend Rolando Pérez, the Director of Science at Orquideario de Soroa Botanical Garden began the paperwork process to be able to take me with him to collect fruits and specimens of our lost orchids at four separate sites in western Cuba. When he received the reply from the University of Pinar del Rio, they authorized only one of the four sites, Ciénaga de Zapata. There was no explanation as to why the other three sites were not permitted, they just weren’t. When I was a kid the governing structure of our house was a sort of benevolent dictatorship and I knew that when I asked my father if I could go somewhere or do something beyond what he was comfortable with, the first answer was always no. Unlike my childhood, where an explanation of the reasons for rejection were usually delivered and my appeal given a chance to be heard, the answer was no and there was nothing I could do about it. After I arrived at Jose Marti Airport, for the second time I was pulled aside and interviewed by a uniformed official before I exited with my luggage. When I walked outside, Rolando was there to greet me. As we walked together to the car rental office right next door, we were stopped by a plain-clothed officer of some type and Rolando was made to show his ID and questioned as to what he was doing with me. These episodes of unnerving, authoritarian inconvenience apparently come with being in Cuba and they were starting to add up. Although I am tempted to complain about the things that I have experienced and felt while in Cuba and to repeat some of the things that my Cuban friends and colleagues have whispered to me, I don’t want to overreact to them or understate the generosity and welcome that I have received from officials of the Cuban government. I’ll just sum it up by saying that my experiences there have made my appreciation of the rights I enjoy as a U.S. citizen something much more palpable. My visits to Cuba have helped to bring out my inner patriot. Driving in Cuba is stressful, especially in Havana. I was glad that I was able to pay an additional fee to allow Rolando to drive the little Kia rental car but I’m not sure how much less stressful it was ultimately because of the way he drove it. He drove us to Soroa where I spent the night in a guest house and the next day he drove us to Ciénaga de Zapata, the bootshaped peninsula on the Caribbean coast south of Havana. Macradenia lutescens in bloom in Dona Tica’s backyard garden. We picked up our friend and colleague Leyaní Caballero who is the community outreach person at the biosphere reserve and a truly lovely person. 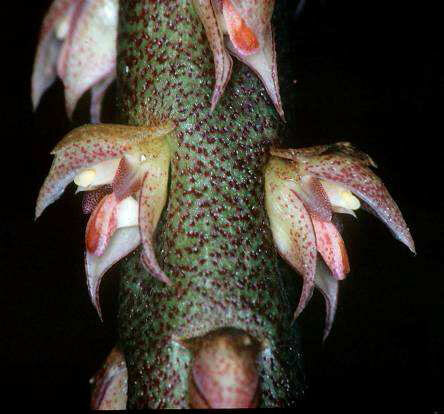 She is also a botanist and she wrote the book on the orchids of the Zapata Swamp. Our next stop was at the home of Doña Tica, a woman who lives in the community on the outskirts of the reserve and a real character. She loves orchids and has a pretty impressive native orchid collection in her backyard, including a couple of Florida’s lost orchids. The four of us made our first exploration into the Zapata Swamp a short drive from Tica’s house. As we walked down the grassy path that led into the reserve, I got my first glimpse of the friendly but antagonistic dynamic between Rolando and Tica, constantly teasing each other and laughing like kids. While Leyaní and I walked behind them, conversing much more amicably, I also got my first glimpse of the swamp’s mosquitos and they got their first taste of me. Over the course of three days we explored the Zapata Swamp Biosphere Reserve. We found many species of orchids, including a monster specimen of the cigar orchid, Cyrtopodium punctatum, growing where we suspect they once grew in Fakahatchee, up in the forest canopy. On our first foray out into the swamp we stumbled across a nice colony of Macradenia lutescens, one of the Everglades lost orchids in fruit and we collected several ripe seed capsules. On day two, we ventured a bit farther out into the reserve to the area of San Lazaro where we collected many specimens of Encyclia and Tolumnia, species of particular interest to Rolando for the botanical garden’s collection. 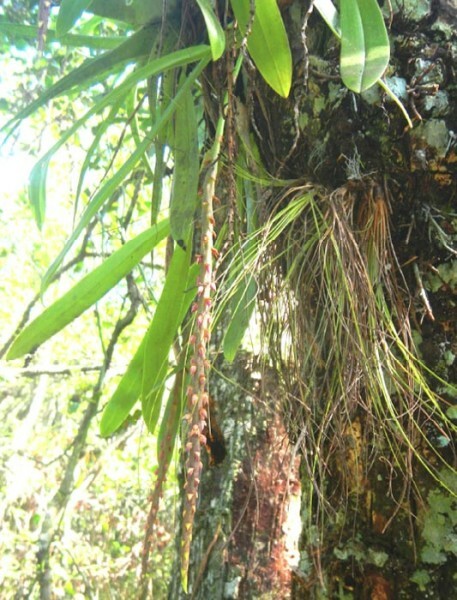 Bulbophyllum pachyrachis in situ, Zapata Swamp. 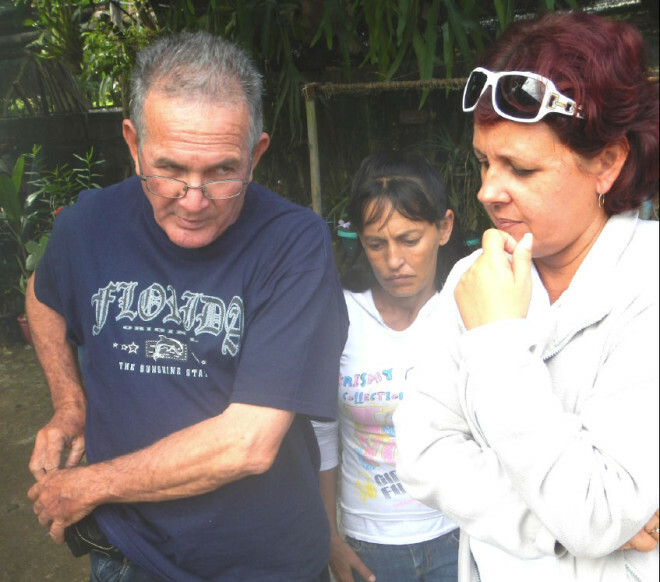 On the third day, we enlisted the help of one of the locals, a man who subsists in part by hunting and fishing around the reserve, whose wife also loves orchids and they, too, have a collection of native Cuban orchids in their backyard. During one of his hunting trips, he encountered an orchid species that caught his eye because he’d never seen a flower like it before. He brought back a sack full of them and attached them to the mango and avocado trees on the side of their house. 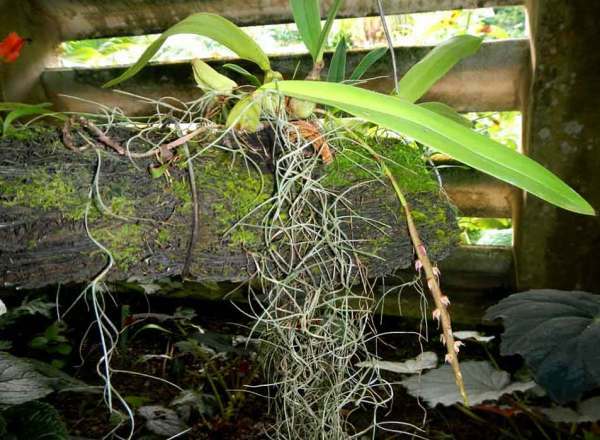 Without knowing it, he discovered the first population of Bulbophyllum pachyrachis, rat tail orchids in the Zapata Swamp. After a two and a half hour drive on a Janes Scenic Drive-like dirt road, we started down a foot path that led us out into the deeper swamp where a world class swarm of mosquitos celebrated our arrival. As we crossed through a marsh and then a deep slough, I patted the machete on my hip and I thought about Cuban crocodiles, Crocodylus rhombifer, a small but reportedly very aggressive species. I hoped that if we were to see one that we’d see it before it saw us. We startled a flock of wading birds from their perch and heard the splashing of something large out in the water beyond our line of sight. As the trail rose up out of the murky water, we re-entered the broadleaf forest. Ahead of us was a fairly large tree, laden with epiphytes. As we walked closer I couldn’t believe my eyes and I found myself looking at something that up until that point I had only dreamed of seeing – a wild population of rat tail orchids. In my head I heard the voice of Mike Owen screaming, “Touch down!” I climbed up into the tree and inspected the dozens and dozens of Bulbophyllum pachyrachis orchids that were at that moment in full raging bloom but the most important question was, were there any in fruits? 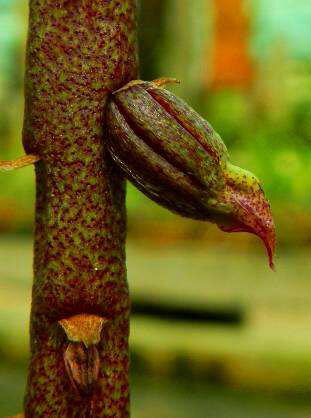 Were there any seed capsules? Dennis Giardina is the Everglades Region Biologist for the Florida Fish and Wildlife Conservation Commission. He was formerly the Park Manager of Fakahatchee Strand Preserve. We started to take pictures and then Dr. Rolando Perez, our host and the Director of Science of Soroa Botanical Garden, signaled to us to follow him. We did and what he showed us blew us away. 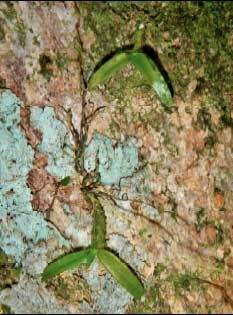 There, dangling from a chunk of wood was Epidendrum acunae. In the space of about three and half minutes, we found both of Fakahatchee’s lost orchids! Mike and I attended the Orchid Restoration Conference, hoping only to tell the Cubans about our desire to find the lost orchids. Neither one of us expected to actually do it! I went back to the Orquideario in May of 2013. I was very cryptic in my E-mail correspondence with Rolando during the intervening months. Although I never reminded him specifically to do so, I thought I made it abundantly clear to him before I left that I was coming back to collect that rat-tail seed capsule. I should have just asked him for it when we were there in October because I know he would have given it to me, but I erred on the side of caution. Ultimately, he did not remember to collect my seed capsule and the tiny, shriveled up seed pod that I did bring back with me, did not contain any viable seeds. Leading up to this trip, I kept my expectations very low. Good thing, because even though it was a few weeks later than when we were there the previous year, when we reached the group of rat-tail orchids, the one or two that were in flower did not have any seed capsules. We eventually made our way around the corner to inspect the Epidendrum acuane and we couldn’t find it. We spent an hour looking around the main greenhouse, then we searched several others and we never did find it. Rolando assured me that his daughter Yunelis would know where it was but for the moment, at least, this orchid was lost in Cuba as well! During our search for the missing Epidendrum acuane, we came across two other notable species, Macradenia lutescens and Brassia caudata, Florida’s East Coast lost orchids. 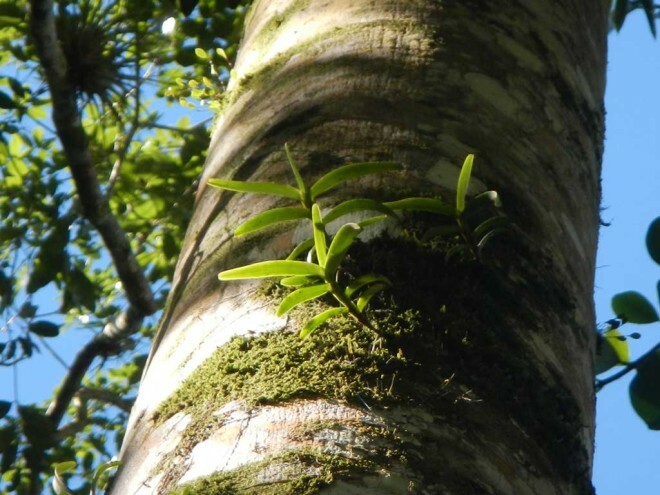 These two species were documented in the early part of the 20th Century, growing in a few of the larger tropical hammocks in the Eastern Everglades in Miami-Dade County. Soon thereafter they were over collected and by 1970’s, they were gone. Brassia’s spider shape and smell deceive the big wasp into attacking the flowers, grabbing and trying to sting them, in the process transferring pollen from one flower to another in a manner called “pseudo depredation.” Macradenia lutescens is a small epiphytic orchid that has a long, cascading flower spike that supports a dozen or more multi-colored flowers that are somewhat variable in color but always quite lovely. On our way out the greenhouse door, I noticed that one of the Macradenia orchids had a nice, unopened yet quite ripe, seed capsule. I was focused on the Fakahatchee lost orchids but our broader plan has always been to bring back the Everglades lost orchids as well. So, even though I imagined that those two species would come later, I felt that life was offering me a gift and it would be in bad taste not to accept it. We promptly snipped it off and I nestled it in the pocket of my camera case. I got the seed pod; unfortunately it went through the ‘smasher’ at the post office. I will attempt to salvage something but it doesn’t look too good at this point. Sorry for the sad update. I had no idea that my letter would go through the metal rollers of the mail sorting machine. If I had, I would have put it in a box. I felt so stupid, then depressed for a week. Although I appreciate the insight of Kipling, imposter or not, Triumph is a lot more fun to hang around with. When it comes to Disaster and Catastrophe, Failure and Defeat, there is really only one refuge, Hope. That is what keeps us going, or at least it’s what keeps me going, back to Cuba. It seems like such a small thing to ask really; just a few seeds of a few extinct Florida orchids, species that are not showy or commercially valuable. They are not species known to have any particular importance in the ecosystem, and their removal from the Fakahatchee Strand, the absence of their presence, has had no broader environmental consequence. I’ll admit that their value may be more psychological than ecological, but my perspective is that our predecessors, the people who sought out these same orchid species and who ultimately over-collected and wiped out Bulbophyllum pachyrachis and Epidendrum acunae, left us with something that I feel is akin to a moral debt, a debt to future generations of orchid biodiversity enthusiasts. To me, that means two things: stopping or reducing as much as possible the continued illegal collection of Fakahatchee’s orchids and bringing the two species that we extirpated, Fakahatchee’s “lost” orchids back. I returned to Cuba for the third time in just over a year on November 10, 2013 to present a paper called “Melaleuca Control in the Florida Everglades, 25 Years of Integrated Pest Management,” at the Caribbean Wetlands Symposium. It was held at Playa Girón Resort, located at the mouth of the Bay of Pigs, next to the Zapata Swamp Biosphere Reserve. My travel to Cuba was sponsored again by the Nature Conservancy’s Florida-Caribbean Fire and Invasives Learning Network. My expenses while in the country were again covered by the Cuban government, including lodging, food, and transportation. The Zapata Swamp Biosphere Reserve is a UNESCO World Heritage Site and the most diverse wetland system in the entire Caribbean Basin. 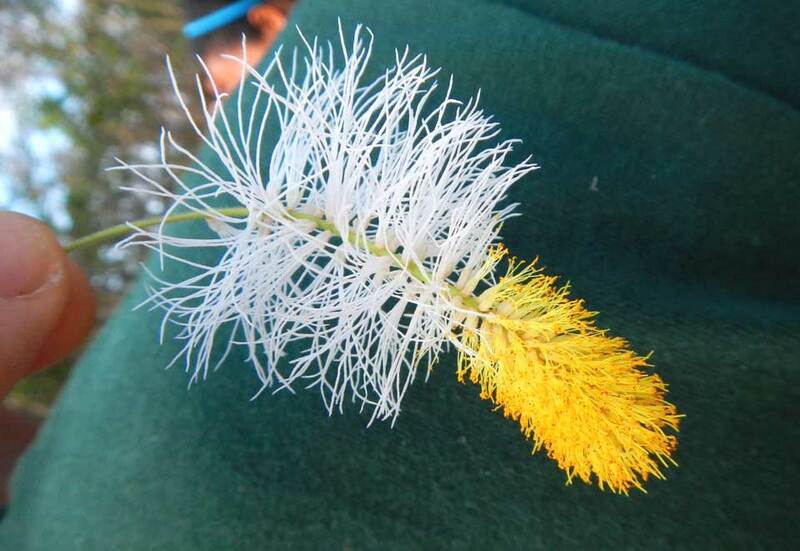 It looks remarkably similar to the Florida Everglades and, like the Everglades, it has Melaleuca quinquinervia invading it. An ornamental stand of Melaleuca was planted approximately seventy years ago on a small island in Treasure Lagoon in the center of the Reserve. Iit has spread aggressively. It was later planted in a few other sites around the region for various reasons, and apparently it has now reached critical mass. 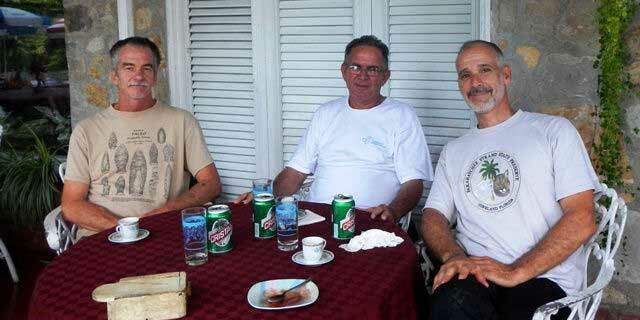 The Cubans have very few resources and no experience controlling Melaleuca. They need help and that’s what we’re continuing to try to do. My ulterior mission, of course, was to get back to Soroa Botanical Garden, the Orquideario, to visit with Dr. Perez. During the last week of October 2012, when Mike Owen and I were there for the International Orchid Conference, one of the several rat-tail orchids that were in flower had a large, ripening seed capsule on it. I hoped, during the third week of November 2013, that there would be even more of a chance of finding a seed capsule there. I actually arrived a day earlier than my colleagues to be able to visit the National Botanical Garden located on the outskirts of Havana with the hope that one of our lost orchids would also be in their collection. After being delayed at the entrance of the National Botanical Garden for almost two hours, and then woozy from a long ride in a tram car pulled by a smoky tractor, my expectations were very low when I entered an enclosed area where they told me that I could see their orchid display. The complex of strangely shaped, connected greenhouses had a pretty interesting collection of cacti, succulents and other desert plants, but there were actually very few orchids and none of the species I was looking for. 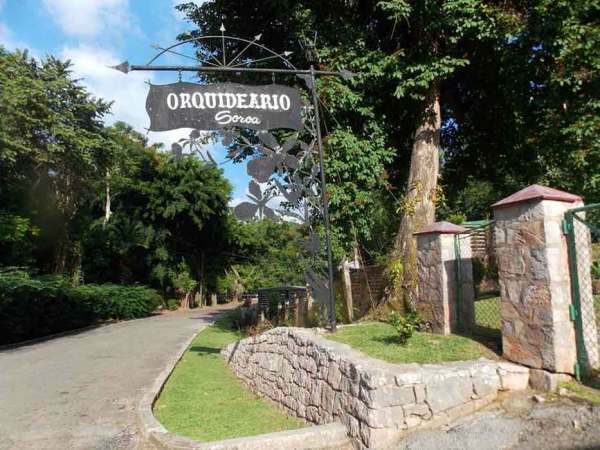 When I asked our tour guide if the Garden had any native Cuban orchids, perhaps not on display to the public, she answered that the best place to see orchids was at the Orquideario in Soroa. Transportation is expensive in Cuba. I checked into renting a car for a day in Havana. I phoned Dr. Perez from Zapata and told him how much it was going to cost; he told me that he would take care of it. On Saturday morning, the last day of the trip, he and a driver that he hired in Soroa, chauffeured me and my colleague Tim Andrus out to the Botanical Garden for the day and then returned us to Havana in the late afternoon. We arrived at about 8:30 in the morning and went up to Dr. Perez’s third floor office that overlooks the Rosary Mountains Biosphere Reserve where we sat and were served some mighty strong espresso. We watched the fog lift and the sun gradually light up the colorful countryside. While Dr. Perez and I talked, Tim explored his library, which included some incredible orchid books from the late 1800’s. He said that he didn’t remember seeing any but that we would take a walk down to the greenhouse and take a look. By then the Garden was bustling with the activity of the staff and the small groups of tourists they attended. Our short walk was full of exuberance. There were orchids everywhere, their flowers bursting from every tree and seemingly every corner, crag and cranny. 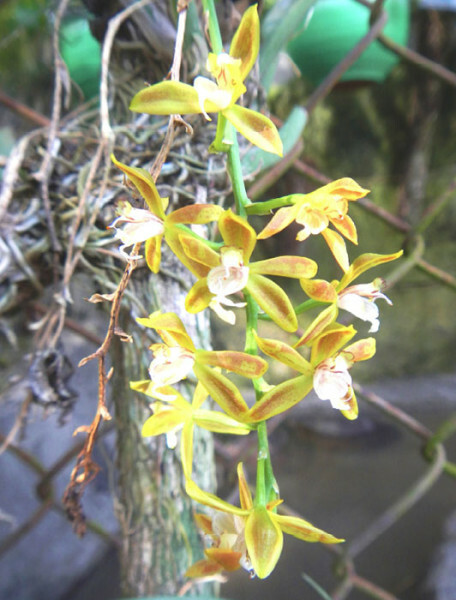 Butterflies fluttered and birds sang until we reached the greenhouse where their collection of native Cuban orchids is kept locked up and off-limits to general visitors. He pulled a string through a seal-imprinted blob of putty inside a bottle cap attached to a tiny wooden box that was connected to the key. He opened the door. I took a deep breath and stepped inside. 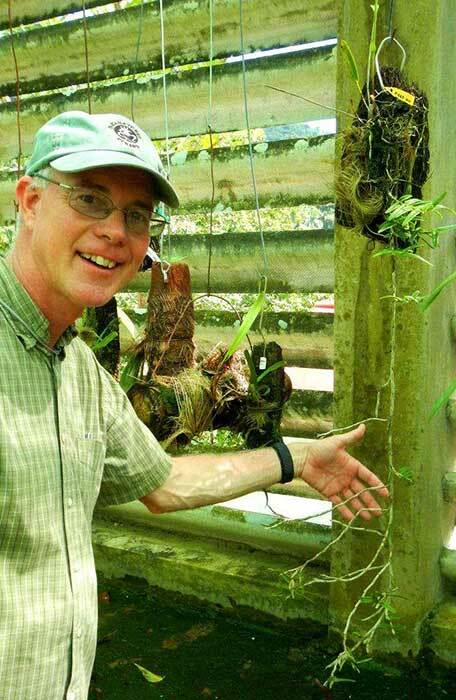 To recap, in 2007, Park Biologist Mike Owen and I entered into collaboration with Matt Richards from Atlanta Botanical Garden to experimentally restore rare and endangered orchid species at Fakahatchee Strand Preserve State Park. 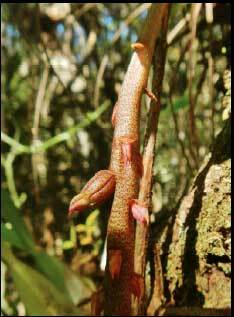 I have written several articles (1) over the years about our effort to restore the cigar orchid, Cyrtopodium punctatum. 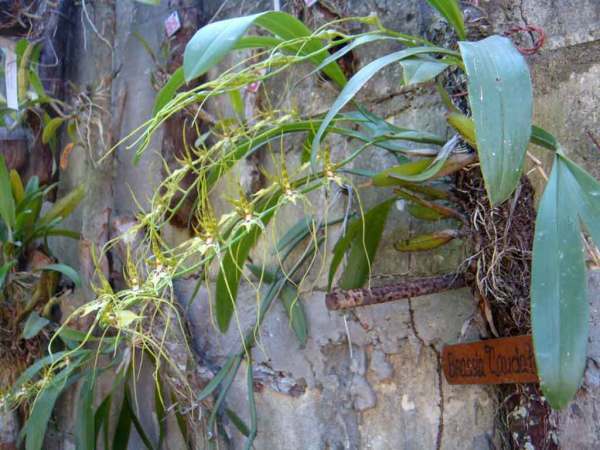 I have also written about our effort to find a seed source for two of Fakahatchee’s “lost orchids,” the rat-tail orchid, Bulbophyllum pachyrachis, and Acuña’s Epidendrum, Epidendrum acunae. The closest, wild populations of those two species occur in Western Cuba. I have written (2) about the trip to Cuba that Mike and I took last year in October to attend an international orchid conservation conference where we co-presented a paper in Spanish and English on our Fakahatchee cigar orchid restoration project and where we made a very fortuitous find. Unbelievably the two very obscure orchid species we were looking for, our “lost orchids,” we found growing at Soroa Botanical Garden, the site of our conference. There were multiple individuals of both species that were grown from seed collected from wild plants in the Rosary Mountains Biosphere Preserve. We just happened to be there during the height of rat-tail blooming season and we were ecstatic to find a half dozen of their rat-tail orchids in flower; one of them had a ripening seed capsule on it! 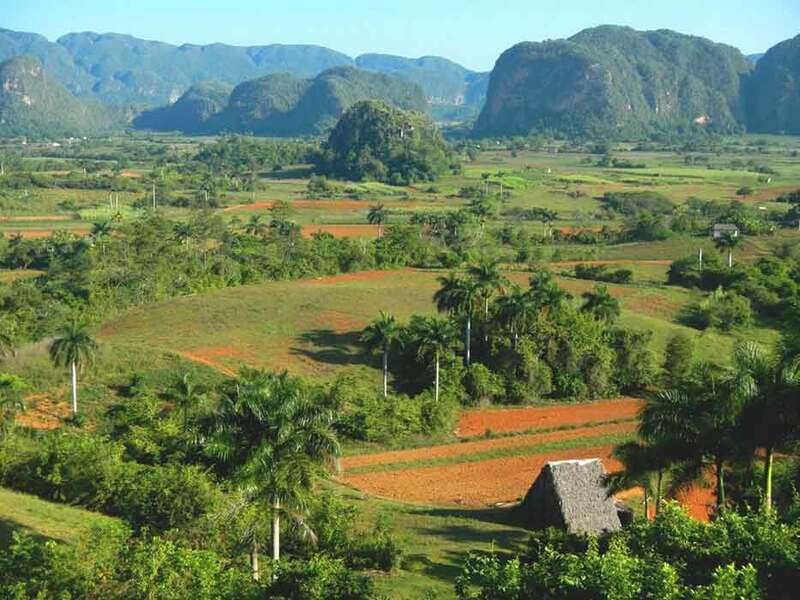 Western Cuba, where the finest tobacco in the world is grown. I was expecting a much stricter environment, but one interesting thing we found while travelling to Cuba was the relative ease of entry into the country. I fully expected to be questioned, perhaps interrogated when we touched ground at Jose Marti International Airport but that was not the case. I also expected to see a lot more military and police presence, especially in Havana, but again, not so. There was a lot of e-mail correspondence between me and Dr. Rolando Perez, Director of Science at Soroa Botanical Garden, without any apparent official interference. When I returned from the conference, I continued to e-mail with him, including sending him photos and he received them all. 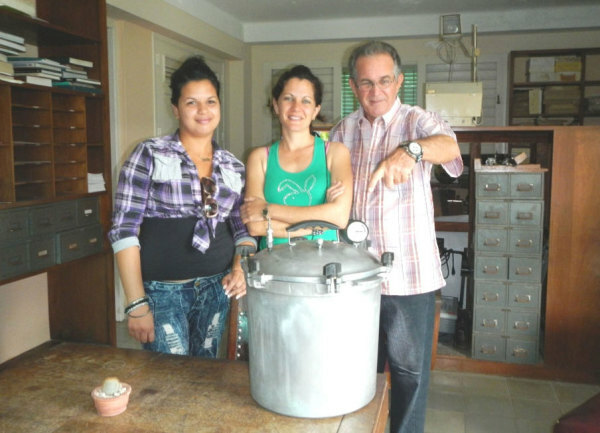 The autoclave taken to Cuba as a gift for the Botanical Garden to sterilize instruments. I brought with me various gifts and supplies for the Botanical Garden, including an autoclave, which is like a big pressure cooker that is used to sterilize the instruments necessary to grow orchids from seed. Their laboratory needed one and Mike Owen found that Wally Wilder, who has assisted him on Central Slough surveys had one and was willing to donate it. My wife begged me not to take the autoclave because she was sure it would get me in trouble. This, my 2nd trip to Cuba in six months, took place not long after the Boston Marathon bombing and the despicable individuals who did it used very similar-looking pressure cookers for their explosives. Dr. Dalia Salabarría, our host and the Director of the National Center for Protected Areas, met us at the airport and she got us and the autoclave right through customs with only quizzical looks from the inspectors. Marabu, one of the invasive plants in Cuba. Our week-long training focused on prescribed fire and invasive plant management and was seemingly very well received by the scientists and land managers who attended. We went all over Western Cuba and when it ended, I visited Soroa Botanical Garden. After I arrived, I waited patiently, biding my time to bring up the question of my rat-tail orchid seed capsule. 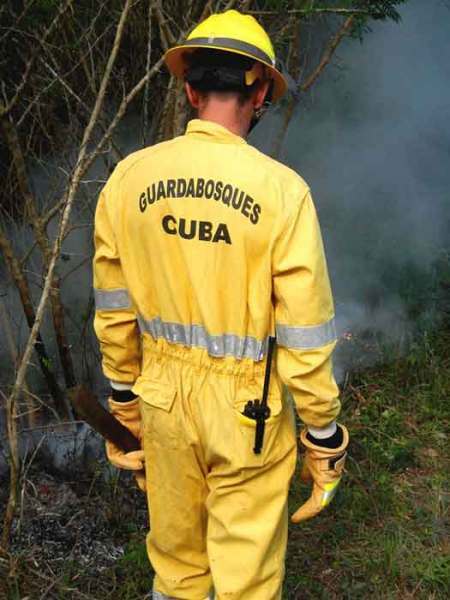 A Cuban forest ranger learning about prescribed burns during a training session. Folks, I have ridden some waves of disappointment in my life, but when he told me that, I felt faint. My vision was reduced to a single point of light, like the screen of an old television set when you shut it off. The shade house contained Soroa’s main collection of native Cuban orchids. We followed him down a row with long benches of potted orchids on both sides of us, many of them hanging from pieces of wood and branches suspended from above. As we followed behind Dr. Perez, I spied one of our mutual native orchids in bloom, Prostechia cochleata, the clamshell orchid. I also noticed another flowering orchid that looked a lot like Encyclia tampensis, the butterfly orchid. 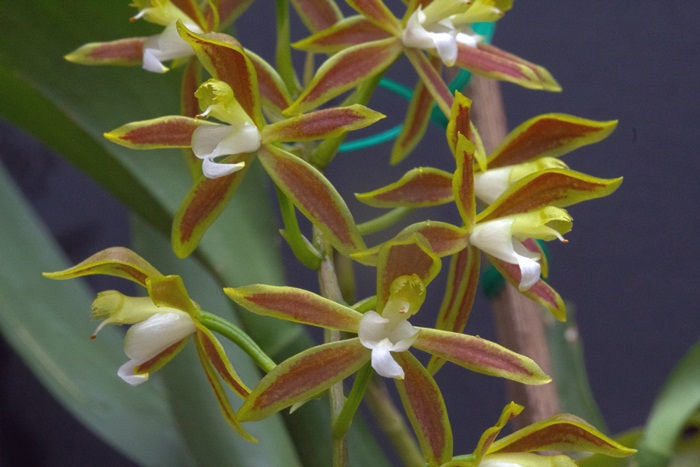 We have two species of native Encyclia orchids in Florida, the butterfly orchid which may be our most common epiphytic orchid, and Encyclia pygmaea, the dwarf Encyclia which is arguably our rarest. 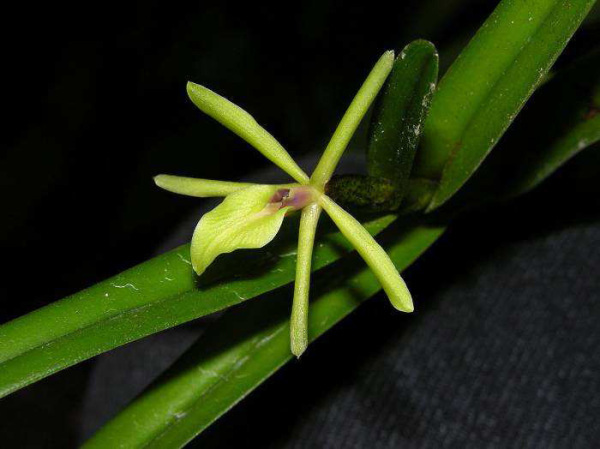 Cuba in contrast has sixteen species of Encyclia, including Encyclia pygmaea but it doesn’t have Encyclia tampensis, which is endemic only to Florida. Biogeography is a pretty interesting thing; the way species arise, reproduce and spread or radiate. Orchids on islands like the ones in the Caribbean are especially illustrative of this. They all spread by seeds that are as fine as dust that get blown far and wide by the wind. Where those seeds land on friendly colonies of bacteria and fungi, they can germinate and grow. They adapt to different conditions and become isolated in their new environment until they speciate, or become genetically different enough from their founder population to be considered a distinct species. Our butterfly orchid surely arose from the seeds of a closely related Cuban species that were carried on the wind across the Straits of Florida to the Peninsula of Florida a long time ago. Dr. Perez stopped at the corner of the row we were walking down but he didn’t even have to gesture or tell us anything; Mike and I saw them from a mile away. Something we only dreamed of seeing, there, hanging from pieces of wood, bearded with Spanish moss was Bulbophylum pachyrhachis! Rat-tail orchids, some in full bloom! It would be hard to exaggerate how ecstatic we both felt at that moment. Until then this little orchid had been an enigma to us, a legend. We knew it only from the accounts of where it was last observed and photographed in Fakahatchee around 1970. Since then, multiple individuals have made repeated trips to that area and throughout the Fakahatchee’s Central Slough where the rarest native orchids grow on the limbs of gnarly old pop ash and pond apple trees below the cypress canopy, above pockets of deep flowing water, but no rat-tail orchids were ever found. Bulbophyllum pachyrhachis is apparently extinct in Fakahatchee, the only place it was ever known to occur in Florida. I pulled out my camera and I started to take pictures, and I probably would have taken hundreds of them if Dr. Perez didn’t signal to me for us to follow him down another aisle. He pointed to a cascade of stems and foliage, hanging down from a piece of wood suspended above a shallow cement basin filled with water. When I realized what it was, I couldn’t believe my eyes or our luck. There it was; Epidendrum acunae, the other one of Fakahatchee’s lost orchids! This one just might be more obscure than the rat-tail. It doesn’t even have a common name. It was named after Julian Acuna Gale, the Cuban botanist who described the species. 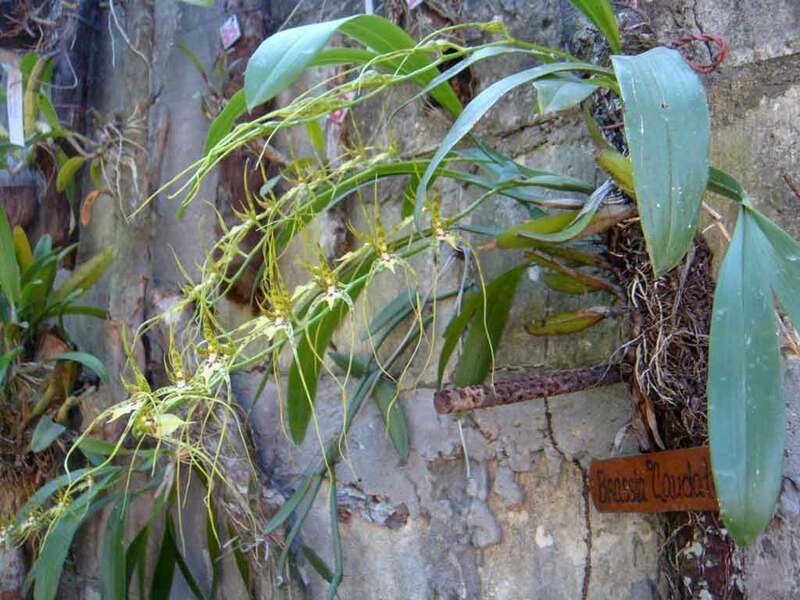 Like the rat-tail orchid, Epidendrum acuane has a huge range, throughout the Caribbean, Central and South America but they’re not really common anywhere. Throughout its range, Epidendrum acunae prefers to grow close to water, and I can imagine it once grew around some of the deep swamp lakes in Fakahatchee before the industrial logging and orchid collecting periods of the mid 20th century. Before we left Soroa, Dr. Perez and I worked out some of the details of how we could collaborate to eventually transfer seeds of the two lost orchids from Soroa to Atlanta Botanical Garden. 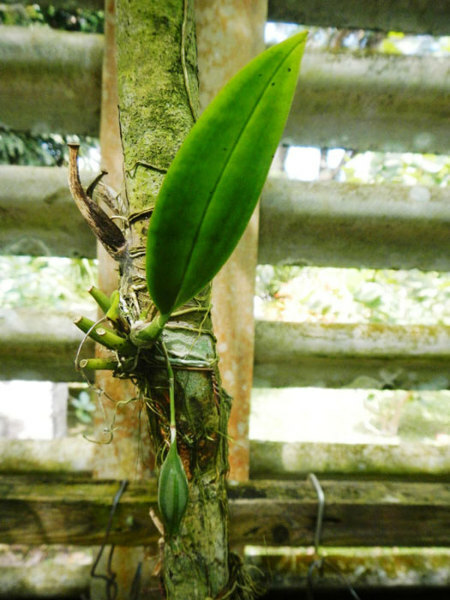 Hopefully this will happen this coming spring with Bulbophyllum pachyrhachis, a little later with Epidendrum acunae, which should begin to bloom in a few months. Mike and I have also started to lay the groundwork for hosting an international orchid restoration conference like the one we attended in Cuba, in May of 2015. Tim and Phil from the Royal Botanical Garden have offered to help us organize, and Fairchild Tropical Botanic Garden has offered to host it. The way it’s shaping up is that there will be three days of presentations over on the East Coast, and then we’ll move everyone over to Everglades City for three days of field trips in Fakahatchee, Big Cypress, and the 10,000 Islands. If we are able to start growing Bulbophyllum pachyrhachis from seed in Atlanta this year, we should have juvenile orchids large enough to experimentally outplant in Fakahatchee by then. The icing on the cake for me and Mike would be to have Dr. Perez and his daughter Yunelis there with us to be part of a pretty historic moment: the repatriation of the rat-tail orchid to Fakahatchee Strand Preserve State Park. I never thought I would be able to go to Cuba. In the past I’ve spent hours looking at maps of the Caribbean, and I’ve wondered about the region’s largest island, its environs, flora and fauna. Cuba is a biodiversity powerhouse. It’s the principal center of evolution and speciation in the Antilles (the major islands of the Caribbean) and one of the most biologically diverse islands in the world, with 42 distinct ecosystems and 23 landscape types. There are 6,519 known vascular plants, including around 350 native orchid species and there are 16,516 documented animal species. Of Cuba’s 612 vertebrate species, 15 mammals, 91 reptiles, 43 amphibians, 23 fish and 22 birds are endemic. 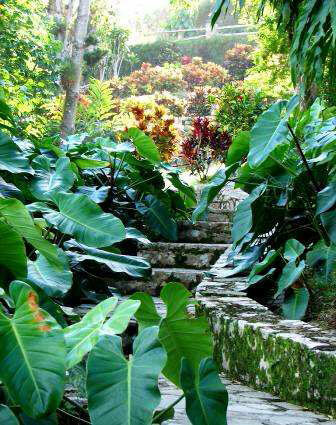 In fact approximately 50% of Cuban plants and 42% of Cuban animals can only be found there. Yes, I dreamed about going to Cuba but there were obstacles, seemingly insurmountable, preventing me from doing so. 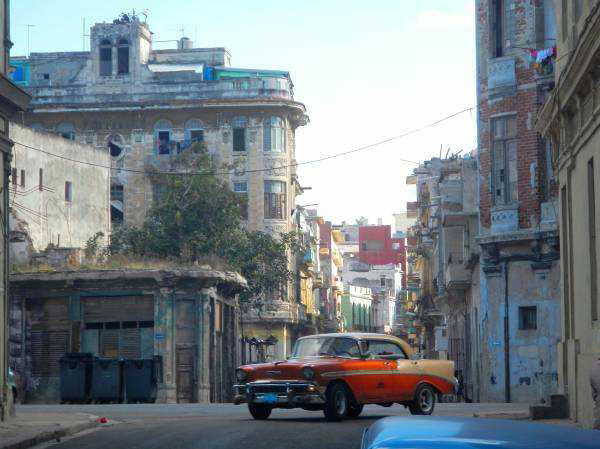 Dennis was taking a picture down an Old Havana side street when this car turned onto it. Havana has many old American cars from the 1940s and 1950s. It’s difficult to talk about Cuba without geopolitics creeping into the conversation. Everyone seems to have an opinion about the Republic of Cuba and its complicated historical relationship with the United States of America, as I suppose I also do. I think that most people would agree that regardless of our different customs, governments, religions and societal structures, human beings are more or less the same everywhere – part murderous monkey, part divine angel and every conceivable thing in between. Regardless, I am way more inspired by the natural world than by the political one. That is what attracted me to Cuba in the first place and is what I hope will eventually bring me back there. Fakahatchee Park Biologist Mike Owen and I have been working together with Matt Richards of Atlanta Botanical Garden’s Orchid Conservation Center to experimentally restore colonies of the cigar orchid, Cyrtopodium punctatum to the Fakahatchee Strand. They were once numerous but are now extremely rare due to over-collecting in the 20th Century. 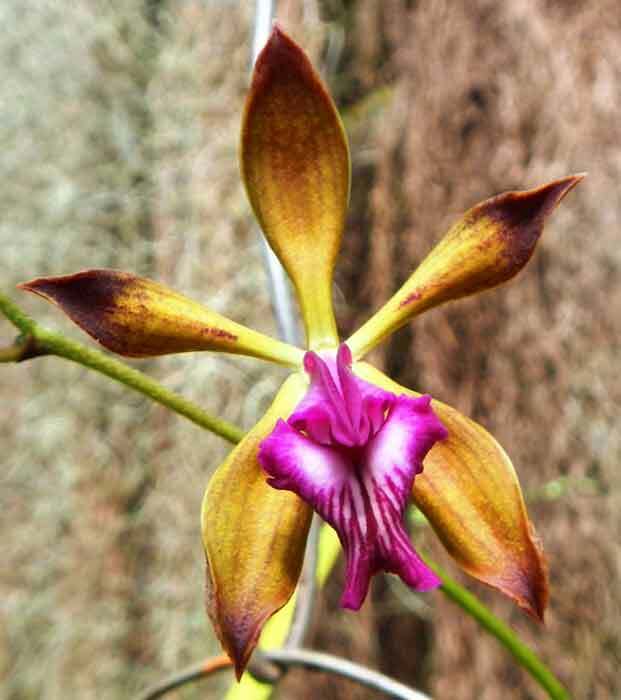 In fact, when we began our project in 2007 there were less than 20 known cigar orchids within the entire Preserve. 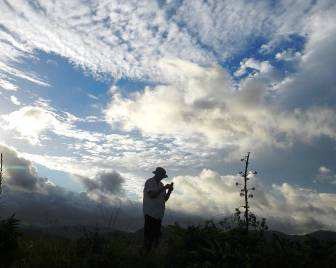 Mike standing on a mountain peak against cloud formation associated with the passage of Hurricane Sandy. 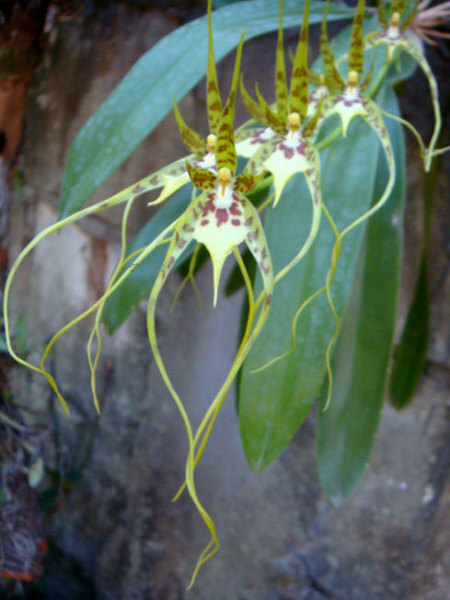 Two other species of epiphytic orchid, Epidendrum acunae and Bulbophyllum pachyrachis, were wiped out by collectors during that same era. In the U.S. they were only known to occur naturally in the Central Slough of the Fakahatchee Strand. Even before the industrial logging period, they were probably rare, found in disjunctive populations composed of few individuals where deep water and the super canopy protected them from frost and desiccation. The nearest wild populations of Fakahatchee’s two “lost orchids,” Epidendrum acunae and Bulbophyllum pachyrachis naturally occur in Western Cuba, where coincidentally Mike, Matt and I were invited to attend an international orchid conference to present a paper on our cigar orchid restoration project. 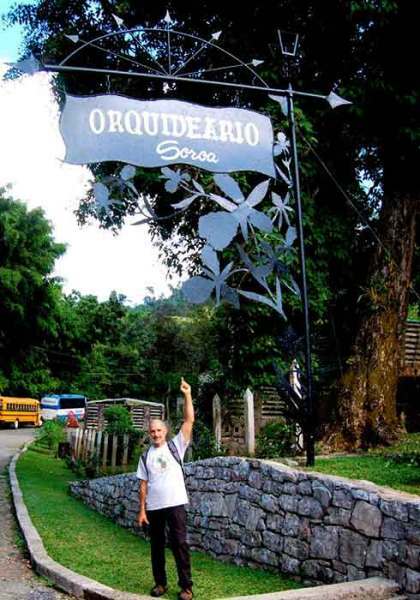 The entrance to Soroa Botanical Garden which is in the Sierra del Rosario Biosphere Reserve. The VIII International Orchid Workshop was held about 50 miles west of Havana at Soroa Botanical Garden. 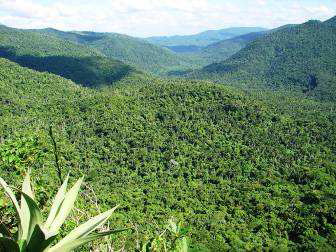 Soroa is located within the Sierra del Rosario Biosphere Reserve, on the eastern slopes of the Guaniguanico Mountain Range in Pinar de Rio Province. It spans about 66,000 acres, and its highest peaks reach about 2,000 feet above sea level from where one can view both the north and south coasts. Soroa Botanical Garden was built upon a karst hilltop where the limestone and vegetation seem to blend one into the other. Rocky stairways wind up, down and around through collections of palms and trees, flowering plants of all sorts and orchids, lots of orchids. 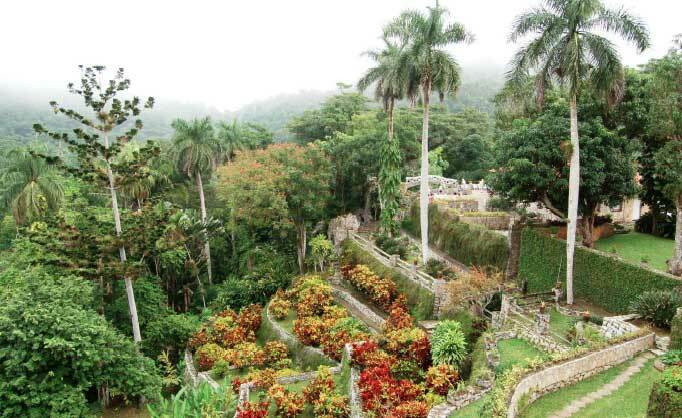 Soroa Botanical Garden has the greatest collection of native Cuban orchids in the country. We spent six days in Soroa but Mike and I hardly saw any of the botanical garden or the surrounding mountainside. Most of the time we were there, we were either in the stone building up in the garden where the workshop took place, eating in a restaurant or on a field trip. There were many interesting, orchid-related presentations given at the Workshop. Many of the participants were members of a group called the Orchid Seed Stores for Sustainable Use (OSSSU). OSSSU is a Darwin Initiative project run by Tim Marks and Phil Seaton out of Kew Botanical Garden, designed to establish orchid seed banking around the globe. 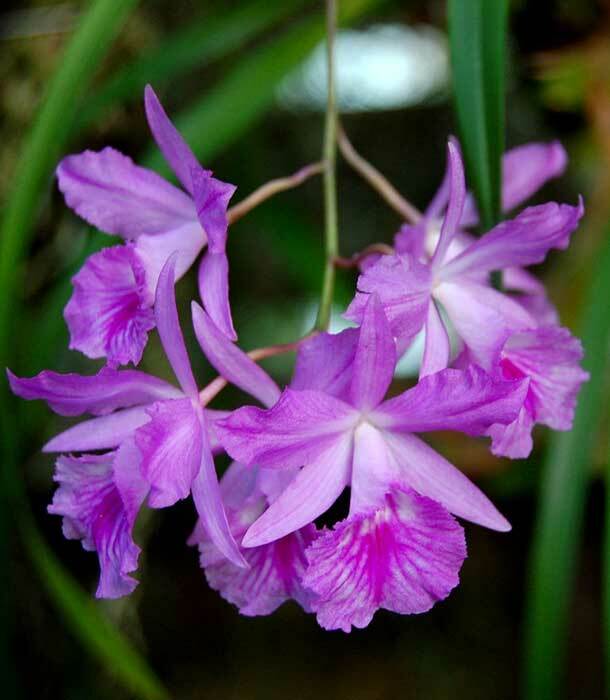 OSSSU aims to collect and store seeds of a minimum of 250 species, focusing on orchid hot spots in Asia and the Tropical Americas, representing the orchid floras of 16 participating countries. The talks were presented in three languages (English, Portuguese and Spanish) with lots of pauses for translation across the cosmopolitan room. Mike and I gave our presentation in both English and Spanish. At the end of our slide show, I made a proposition to the Cuban botanists in attendance, but especially to Dr. Rolando Perez, the organizer of the Workshop and the Director of Science there at Soroa Botanical Garden. Our last slide showed a satellite map of the Caribbean, with arrows pointing to Fakahatchee Strand and Soroa, Cuba, demonstrating how close the two are to one another. Both places and their respective land masses are separated only by the Straits of Florida. I said that Mike and I would like to attempt an experimental restoration of the two Fakahatchee lost orchids using seed from populations of both species from the Soroa area. I told them that my dream was to locate plants already in cultivation in a private collection or a botanical garden in Cuba that were grown from local, wild seed. Step two would be to enlist someone to pollinate them, collect their seeds and send them to Soroa Botanical Garden. 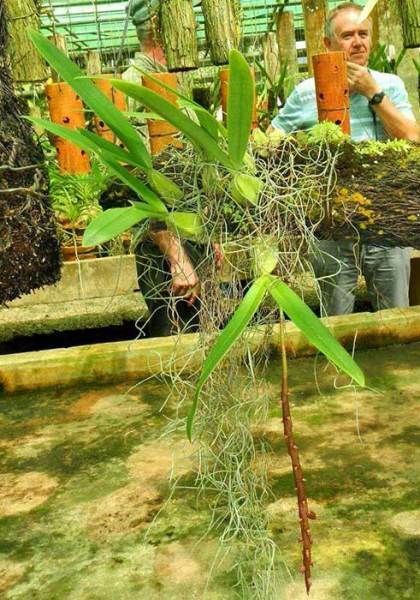 Somehow then we’d arrange a way to transfer those seeds from Soroa to our partner Atlanta Botancial Garden so they could grow the Epidendrum acunae and Bulbophyllum pachyrachis plants. After two years of growth in Atlanta, the plants could be ready to out-plant in Fakahatchee. Finally, we celebrate with our Cuban collaborators who will be with us in Fakahatchee when we establish our first experimental restoration plot of one of the lost orchid species. As I laid down our proposal, I had an eye on Dr. Perez who sat very stoically in the front row. Some of the other Cuban botanists approached me at the break following our presentation and expressed their interest in our project but I didn’t get a chance to talk to Dr. Perez. The next day, at the end of the morning session, Dr. Perez asked me to sit down with him to talk more about the details of what I proposed. Dr. Perez and I had been developing a rapport over the previous two days, and I was really hoping that he would be receptive to our invitation to collaborate with us, especially after we learned that he and his daughter Yunelis were leading a similar experimental orchid restoration project in the Sierra del Rosario Biosphere Reserve. After we talked a while, he said that he might be able to help us and we shook hands. He told me to come back from lunch a little early and to bring Mike with me.